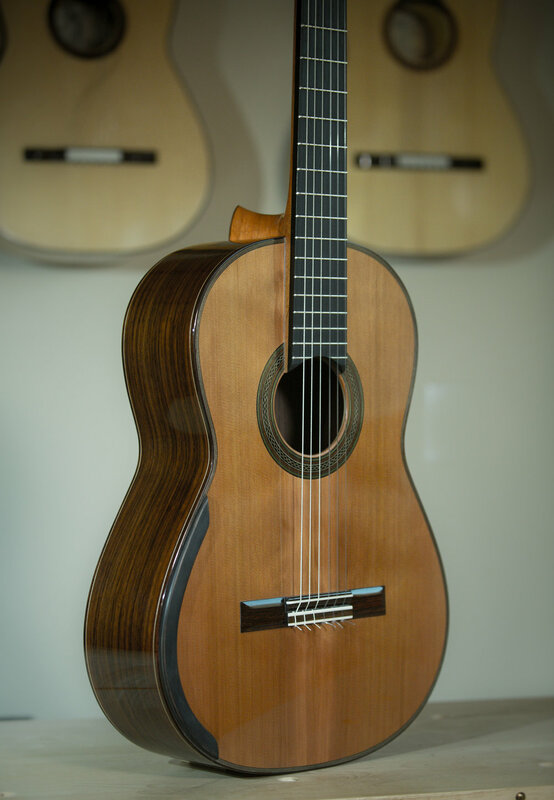 New Brazilian rosewood DT with balsa core. My friend and apprentice, and V-Carve master Eric Olsen and I, have been working on some new concepts for a DT/Balsa core ... Very excited to make some new DT's from this design. Very difficult to make because of the thin tolerances, almost like Nomex/Balsa. 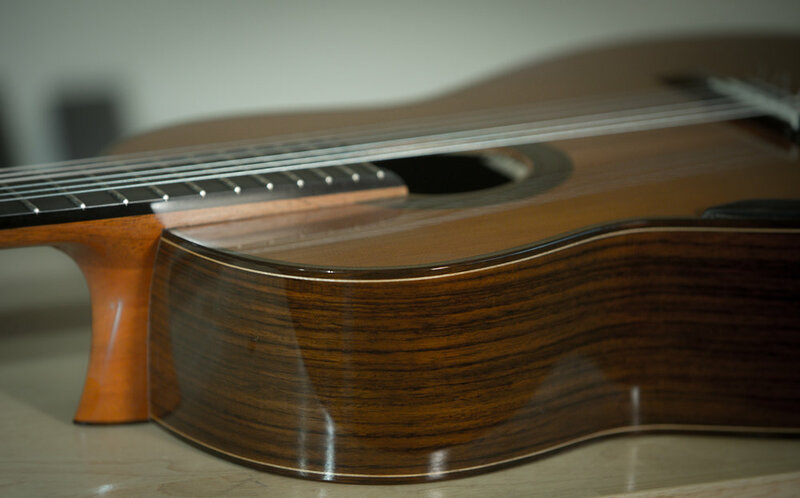 The wood directly under the bridge has the balsa going in a different direction than the 45% angle for more strength under the strings. Your good friend Rene delivered the guitar today at 4pm Singapore time. The moment I set eyes on it after opening the case I was blown away. 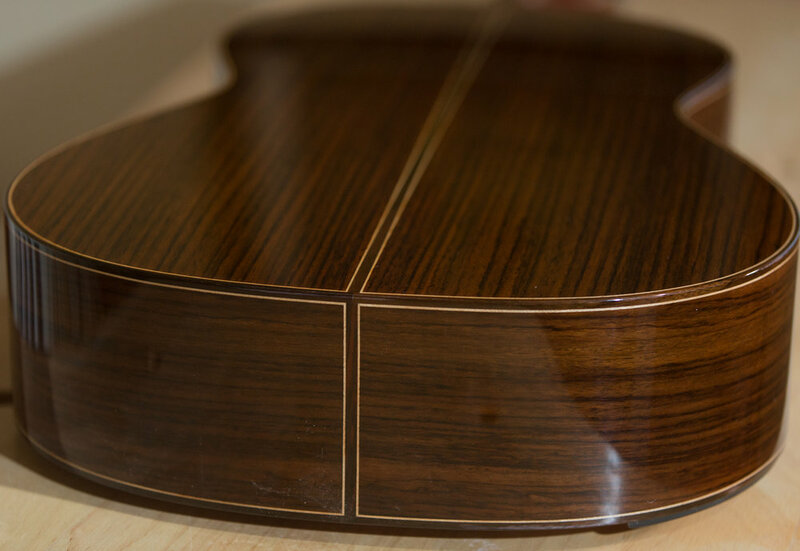 The french polishing is superb, top notch. I have played Spanish made guitar that is french polished, they cannot compare with yours. The guitar is beyond my expectations. The trebles have sweet and bright sound and good sustain. Bass have strong and deep tones. All round very good volume and projection, good enough for concert playing. Overall very very satisfied with the guitar. Everything I have ever wanted in a guitar. You make wonderful and beautiful sounding guitar. Below is a video of Peter Pakhomkin playing this guitar shortly before send her across the ocean. This guitar went to a client in Hawaii last week. The guitar is a cannon...a beast to play! 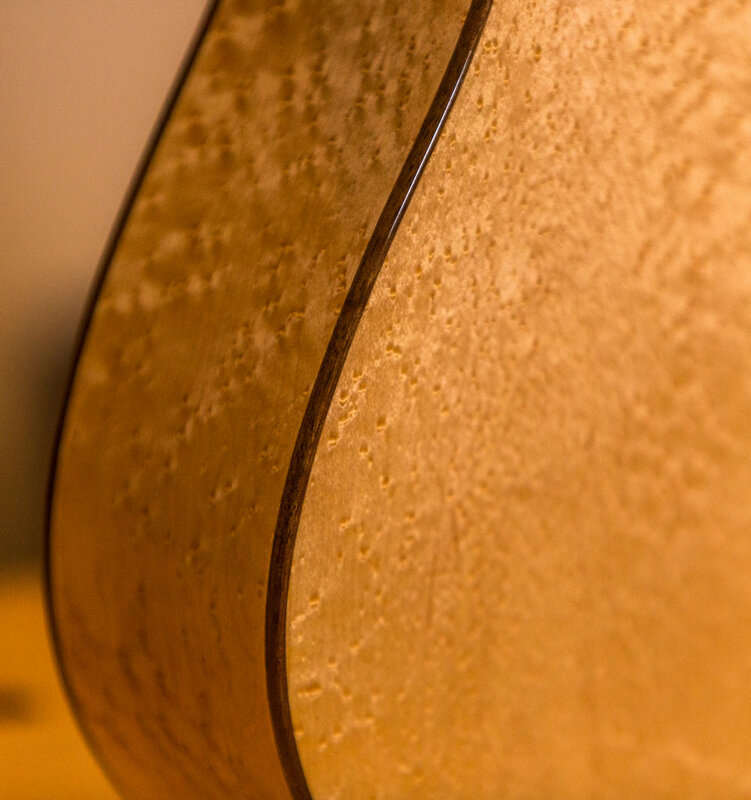 The basses are crisp and trebles are strong... a well balanced guitar ready to play a concerto. The sound is assertive and will only get stronger as time goes on. This is a real concert guitar better than the double spruce top that you made for me. 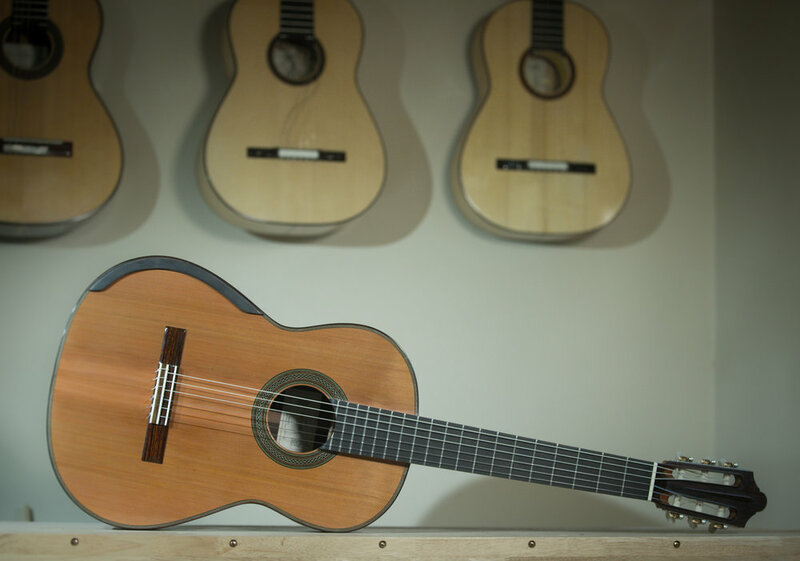 Though the Sprucetop has increased in volume and character, it would be interesting to play both guitars side by side. Below is a video Mike Dezavelle made before shipping her out. Mike uses the Abel Calavero technique choosing not to use a thumb nail. Matt Palmer performs "Neil Gow's lament for his second wife" and "Julia Florida" by Barrios, on a Michael Thames Torres La Leona copy guitar. Torres "La Leona" video project with Matt Palmer. 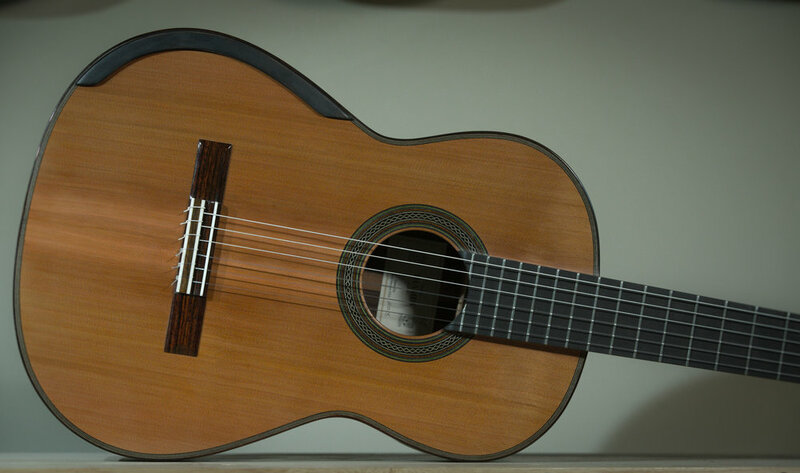 In Late June the incomparable Matt Palmer flew to Santa Fe, NM to record a series of videos and CD on a Torres "La Leona" copy guitar I made for him special for this occasion. 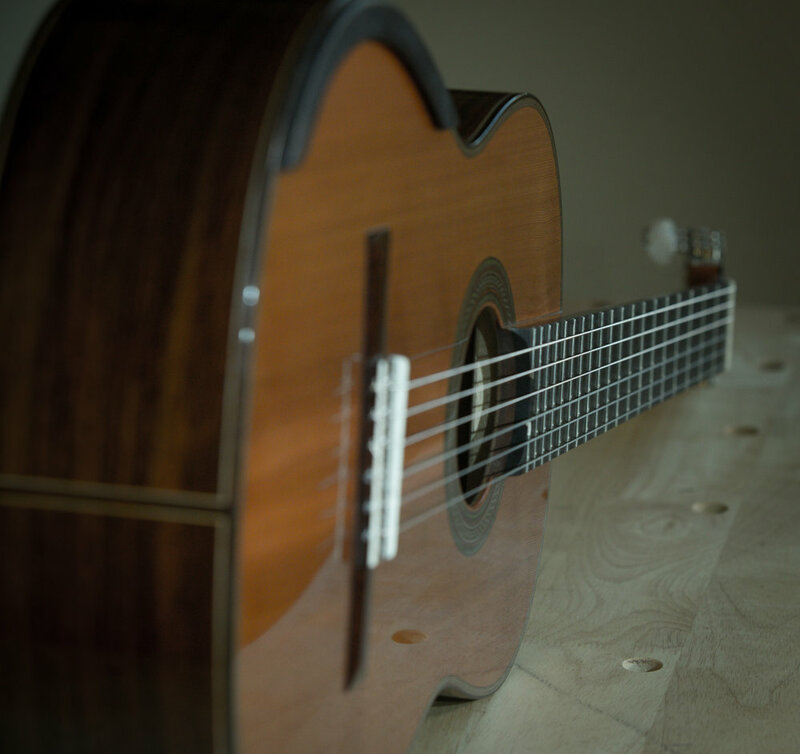 Photos of this guitar can be found here in my blog. Stay tuned for more in this series of very special videos.